I am a hopeless braggart about my thrift store finds. While I work on eliminating this unseemly behavior, I have to share two fabulous pieces that were recently thrifted for a song. This all-silk striped skirt by Ralph Lauren (similar) goes with everything in the closet, except my pajamas. It has a wrap waistline (unseen here but you’ll see it in the future). and a floaty asymmetrical hem. The original price tag was still on, with a price of $138, reduced to $94 retail. My price was $12.50 Canadian (so about $10 US) – thank you Suzanne Carillo for taking me thrifting! The slouchy black sweater-tank (sim) was found in a NYC thrift for about $30. It’s by Stella McCartney and it feels like heaven. My new red Spring Step sandals (here) are retail, and worth it – super-comfortable, cute shoes sometimes require paying full price. Beaded necklace was created by that same Suzanne, and you can look at her treasures here. My hair resembles Cousin Itt here. 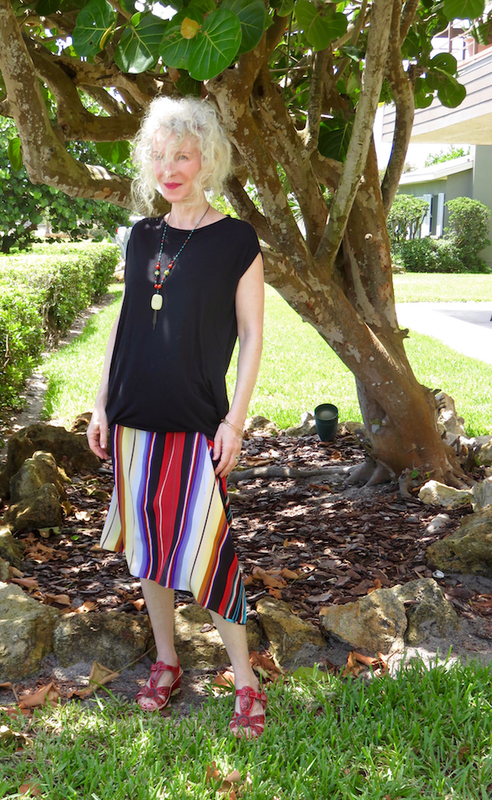 Love, love the stripes and asymmetrical hemline, and my new funky sandals. I’m glad you found some good thrifting scores when you were here in Canada. The skirt is soooo cool, definitely worth showing off! Zoiks, I missed a Visible Monday! Must make up for that this week! Love this awesome skirt, Patti! Many of RL’s patterns are too overpowering, but this bold stripe just hits the sweet spot – what a score! I love the stripped skirts!! Beautiful. I adore stripes, and your find is simply fabulous, Patti! Love your styling with the black top and beautiful sandals and necklace, you are ready for anything! Thrifting is the BEST. It was much easier back in the 80s when I was a size 6/8…but I still get great deals. I LOVE that skirt & must have those shoes! Great find Patti and a fashionable memory of Canada! This skirt is unique, I love the style and you look youthful as always! You are so funny! I think your hair is so much better than Cousin Itt! You look fab as always! Only 10 US smackers for that beauty? Good one! Looks fantastic with that Stella top, yet another eagle-eyed score. I adore unseemly behaviour like this. Keep it coming! Great photo. Thanks for hosting, Patti. Such a fabulous skirt! I always love stripes and the colors in the skirt are so pretty. Plus the hemline adds so much interest! Great outfit! And I absolutely agree that cute, comfortable shoes are worth paying full price for! Love the colors and the hem Patti! The necklace is so colorful and the perfect touch. No worries about your hair, my friend! mine in the summer is miserable! Sweaty, sticky, and frizzy! I love me a good stripe, Patti, and yours are good stripes indeed. Non uniformed. Rainbow of colours. With an asymmetrical hemline to boot 🙂 oddly enough, I’d never thought of stripes as being prints (I know) until recently. I enjoy reading about thrift store finds, as it encourages me to look for unique finds of my own. I also love stripes and your colorful skirt is simply wonderful and perfect for summer! I love anything asymmetrical. This look is perfect and even better as its thrifted. It’s good that you brag about your finds—it reminds us that you can get fabulous deals anywhere!! The asymmetry of the skirt is what makes it so fun! You are one cool chick, Patti. I bet that skirt feels delicious on. Patti, everything about this outfit is perfection! I am on a thrift store kick recently myself and it feels so good to find great pieces for such great deals! I just scored a gorgeous, perfectly-broken-in dark brown leather jacket from Wilson’s Leather for $9! I can’t wait for Fall now to wear it! I am linking up my recent scarf haul from my local thrift store! Thanks for the link up and be sure to come link up On the Edge of the Week as well! That skirt is sooooo lovely Patti! Such beautiful skirts Patti. And I love the one that you are wearing too. I am always a fan of a striped skirt. Don,t blame you one bit for bragging , you have a good eye and always seem to uncover a gem and that great striped skirt and top are no exception. Many thanks for hosting Visible Monday Patti. I love a good thrift store find! Such a nice outfit! Simple but full of character and interesting details! Great find, Patty! The skirt is simply amazing! And I love the sandals too! I am a sucker for anything stripes, love the fun colors and cut on this skirt. Very pretty and a bargain too! Thanks for sharing and hosting. There is nothing wrong with thrifting. It is about being resourceful. Some woman’s trash or misfit may be your treasure or fit you. It is a win-win for both. She gets at least some money back on her mistake or the piece that doesn’t fit anymore due to menopausal body change and you get an awesome piece for less. It is probably still more expensive than fast fashion, where in my opinion, where one is a looser including the environment. Thank you for hosting us every week – I so enjoy seeing everyone and am inspired by all. As always you look fabulous! It looks awesome and I love those new sandals! What people don’t realise is just how wonderfully slinky and soft that skirt is. Those sandals are the ones you wrote about that were so comfy right? I’m going to have to give them a try. Maybe I can score some on super sale now. A Stella McCartney sweater for how much ? Can I come shopping with you ?!! Great skirt! Thank you for hosting! Those are great thrift shop scores! OH Patti cha-Ching…fab find!! Love this look from head to toe, so fun, unique and amazing color combo; an eye catcher for sure you gorgeous lady!! Really cute skirt, Patti! Thanks for the link up and have a wonderful week! Your skirt reminds me of one that I have in the Repair Mountain. Sigh. Brag away, you’ve earned that right. It’s a fabulous skirt, I’d ve bragging too, if it was mine.